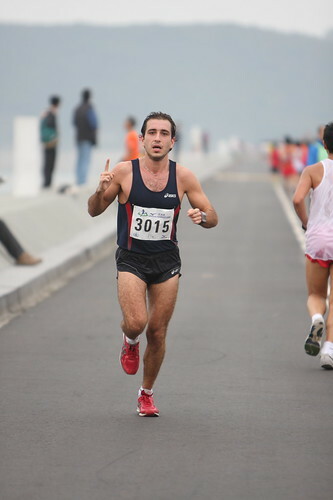 Inizio d'anno molto positivo per la nostra rappresentanza podistica a HK: Stefano P. vince il Campionato Nazionale di Mezza Maratona, distaccando tutti di quasi 1 minuto!! Una vittoria meritatissima per Stefano che ha battagliato per mesi con la tendinite, ma ha sempre avuto la costanza di tenere duro e seguire una lunga riabilitazione! I must also sing praises of the ShockWave Therapy... I found out that it was also available in Hong Kong and had some session which greatly improved the problem of the adhesion between tendon and his sheath. After only a couple of session I felt much better and the "pinch test" was a very positive indicator of improvement. Now I must obviously avoid getting carried away and I will stick to run every other day for 15-20 minutes max for all the month of January, to see if the tendons hold. No long terms plan or yearly plan, just take one week at the time. ==> around 5500km, 170 rides in around 200 hours (MTB+Road).. (not bad, but also not not impressive...)..
As a side effect of the injury, I should have also done a total of all the medical and non medical expenses related to the problem, but it would be too shocking. Between medical care not covered by the insurance, expenses for cycling stuff, etc, etc...the total easily amounts to several thousands USD... so I really recommend to take care of your injuries in a preventive way becuase it is better to spend some money earlier on new shoes, orthotics or massage than later shell out 100USD/session on the PT bed..